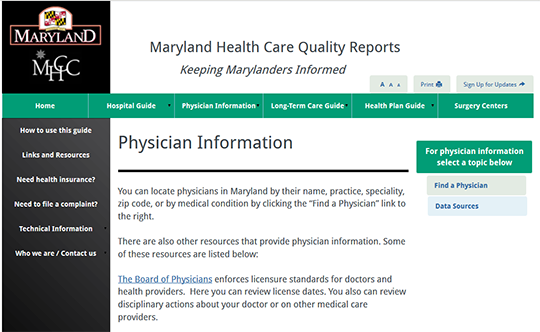 The Physician Information card provides information on physicians in Maryland. It includes features for finding a physician by name, medical condition, or location. It also highlights several resources available to consumers who want information on physicians in Maryland including a link to the Board of Physicians and CMS’ Physician Compare. A consumer checklist document is provided as a tool to help consumers plan for a visit with a doctor.